Are you ready to celebrate Canada’s 150th birthday? It will be here before we know. I’m thinking such a momentous occasion deserves a week of celebrations. 150 years is a big deal so I’m brainstorming ways to share in the fun. Of course, a summer party needs to have a BBQ. Whether you are inviting a whole gang of friends and family or just keeping it small, you’ll need some delicious BBQ recipes in your arsenal. 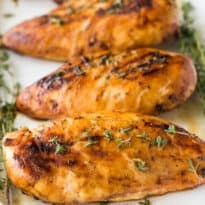 My Maple Dijon Grilled Chicken is a great choice. I wanted it to be easy to make, taste delicious and have a Canadian spin. Maple syrup is one of Canada’s favourite ingredients. Chicken is also a Canadian ingredient, in my opinion. The Chicken Farmers of Canada have been working hard for 150 years to bring our families quality chicken. It’s a great time to thank a farmer for all they do for us. Did you know that over 90% of Canada’s chicken farms are family owned and operated? With Canadian chicken, you know that the meat you are feeding your family is raised to the highest possible standards. Canadian farmers must follow a strict and mandatory audited Animal Care Program. 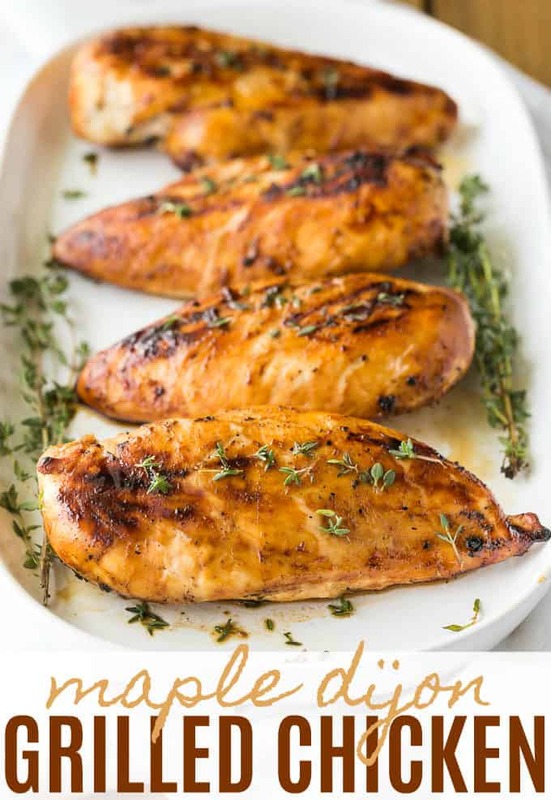 I selected chicken breasts for this recipe, but you could always use another cut of chicken. Just use the same marinade and grill away! Once you have your chicken, whip up the marinade. I bet you already have the ingredients! All you’ll need is maple syrup, Dijon mustard, soy sauce, garlic and fresh thyme. If you don’t have fresh thyme readily available, it’s ok to leave it out. I just like the pop of colour it adds and the fresh flavour profile. Brush the marinade on your chicken breasts a few times at the start of cooking. After that, you should have enough of the flavour infused into the meat. Serve with a pasta salad, BBQ potato or another summer side. You could even put a chicken breast on a bun and top with a mixture of Dijon mustard and maple syrup for an added punch of flavour. I’m getting hungry just writing this post. How about you? I’d love to hear how you are celebrating Canada’s birthday and more importantly, what are you eating on the big day? 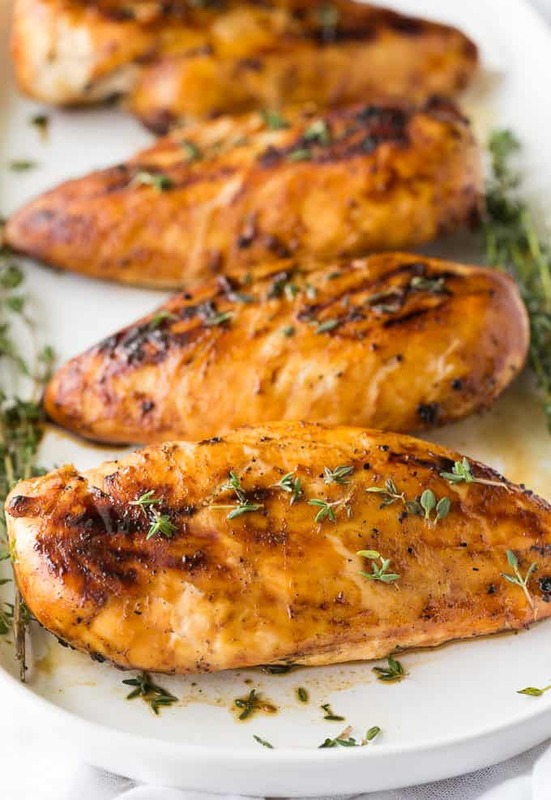 Maple syrup and Dijon mustard are a match made in heaven and taste delicious on a grilled chicken breast. Preheat barbecue to medium heat. In a small bowl, stir together maple syrup, Dijon mustard, soy sauce, thyme and garlic. Make shallow cuts to both sides of the chicken. Brush marinade over both sides of the chicken. Place chicken on the barbecue with lid down. Turn and baste often with marinade for the first five minutes. 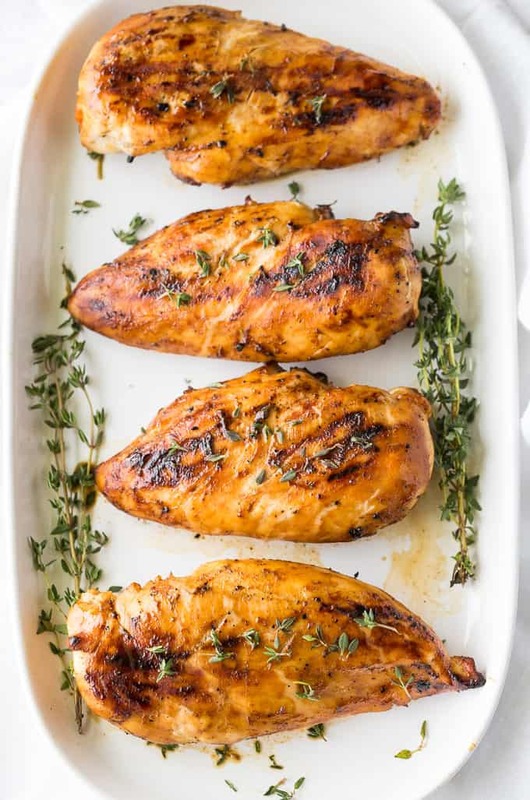 Continue to barbecue until the chicken feels springy when pressed and a meat thermometer reaches 165F, about 5 to 7 more minutes, depending on your barbecue. You might also like this Honey Sriracha Chicken. Connect with the Chicken Farmers of Canada on Facebook and Twitter.